Twenty-two years ago David Ginn created a simple little magic kit for sale after his summer reading shows at the Georgia libraries. 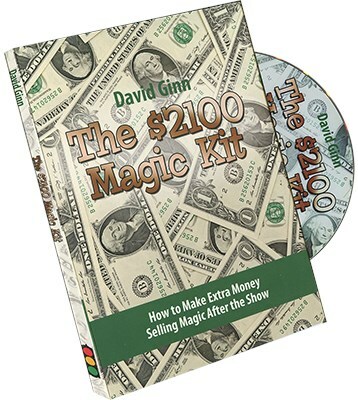 When the smoke cleared at summer's end, the "Official David Ginn Magic Kit"had sold out of two printings - Over 2100 kits at one dollar each. With an investment of less than $350 at the time, David's little kit profited over $1800 cash, which paid house notes, home bills, plus food, gasoline and lodging on the road. Used effectively, this can become a profitable way of marketing yourself while encouraging and teaching others. David Ginn shares with YOU, for the first time in print, how you can do the same thing! Not only does David demonstrate the kit on this DVD, but he shows you WHY it sells, WHERE it sells, and HOW to make your own - keeping your expenses low and your profit high! He also includes ways to vary what's included in the kit, thus making it changeable from one year to the next.